Charlotte Rose Kelly, 4, was diagnosed with neuroblastoma two years ago. Charlotte’s Run, which is next Sunday at 10 a.m. in Braintree, is all because of Charlotte Rose Kelly. But it is not for her. It’s to raise money to annihilate a disease that this brave but tired 4-year-old has been battling for nearly two years. Charlotte was 2 1/2 when five doctors walked into a room at Children’s Hospital Boston and gave her parents, Patrice and Greg Kelly, the incomprehensible news that their beautiful little girl had stage IV neuroblastoma, a rare and deadly form of childhood cancer. Chemotherapy. Surgery. Radiation. Two stem cell transplants. Antibody therapy. Vomiting. Nose bleeds. Shots. Infections. Weight loss. Hearing loss. Constipation. Diarrhea. Sores. Transfusions. Fevers. Pain. And dozens of hospital stays. This is what Charlotte has endured since June 17, 2009. And this is what her parents have had to watch her endure in the hope that their daughter will survive. “The doctors are optimistic that our baby will be cured,’’ Patrice wrote on the hospital’s Care Pages, a website designed for patients and families to communicate with friends and relatives, the day after learning that the mass she felt on Charlotte’s stomach was a cancerous growth. Neuroblastoma, they learned in a crash course, affects mostly infants and young children; some 650 cases are diagnosed in the United States each year; and 30 percent of children, with treatment, survive. The Kellys hung their hopes on the doctors’ optimism and this 30 percent. But Charlotte has not been cured. 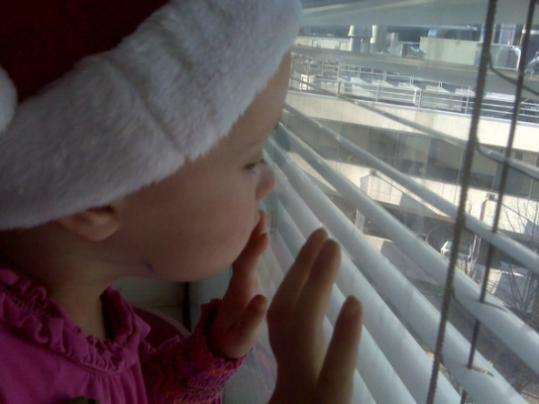 Despite all her treatments, she has relapsed and there is no known cure for relapsed neuroblastoma. She has an inoperable tumor in her sinus cavity and her only chance for survival is if she is accepted in a trial study that is experimental — and then if the experimental treatment works. Yet hope continues to propel this Braintree family. Hope and prayers and people, visiting, doing, giving, encouraging. Offering rides. Cooking meals. Babysitting. Opening their arms. And their hearts. Charlotte propels them, too. Her essence. Her smile. The way she pretends to be brave for them. They’ve had to crush up pills so toxic that they had to wear gloves and a mask to feed them to their baby. They’ve had to watch their daughter suffer. And get better. And then get worse. Over and over again. They’ve had to explain to their boys, who are just 9 and 7, how very, very sick their baby sister is. They’ve had to watch all three of their children lose their carefree childhood. All these months of treatment later, she still cannot believe her baby has cancer. It is only because of other people that she and Greg are able to get up every day. Friends and family and coworkers and neighbors and strangers have helped this young family endure the unendurable. Care Pages have also helped. Reading what people write, knowing that even strangers care. “When I feel like I can’t do it anymore, these words help,’’ Patrice says. Charlotte’s Run next Sunday isn’t about finding a cure for Charlotte Kelly. It’s about finding a cure for neuroblastoma. All money raised goes to research, and although registration for the run is closed because 1,500 people have signed up, the after party, featuring former NFL quarterback Jim Plunkett, is wide open. It begins at 11 a.m.
Charlotte was discharged from Children’s Hospital last month. The Kellys cling to the possible. And they pray. For information about Charlotte’s Run, visit www.prayersforcharlotte.org. Beverly Beckham can be reached at bevbeckham@aol.com.